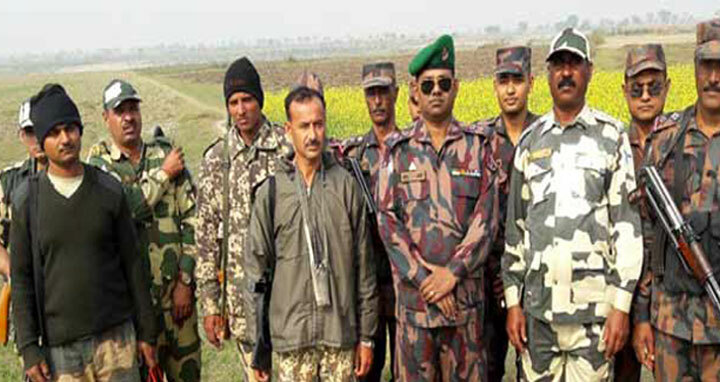 Dhaka, 25 Dec, Abnews: Bangladesh border guards have handed over three Indian Border Security Force (BSF) members who were held this morning for trespassing into Bangladesh territory. The detainees identified as - Assistant Sub Inspector (ASI) Harnam Shingh, constables Rakesh Kumar and Santosh Kumar, hailed from Harudanga camp of Border Security Post (BSF) in India were handed over around 1:20pm. Border Guard Bangladesh (BSF) personnel detained three members of India's Border Security Force (BSF) at Rajshahi border after they trespassed into Bangladesh through Hajir Bathan area on Monday morning. During the handover, the arms, mobile phones and walkie-talkies seized from the three Indian border troopers were also given away. The Indian side said to have admitted their fault and pledged that such incident will not have a recurrence.